Story by Michelle K. Photos by David Keogh. 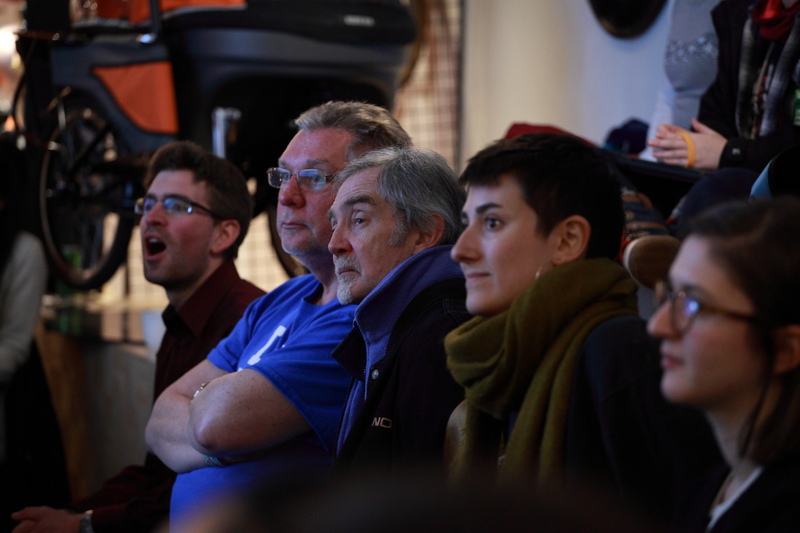 BIKE MINDS kicked off its 2019 storytelling season on January 30, 2019, at Fix Coffee ­+ Bikes with a focus on the impact of traveling on the saddle, unexpected destinations, and the challenges and hurdles overcome along the way. Matteo rode his bike from Toronto to Miami, attempting to understand life with less money by only spending $50 on food, relying on dumpster diving, fishing, foraging and the barter system. He then spent three months in Haiti, followed by four years living out of saddlebags cycling North and Central America volunteering and following permaculture/appropriate technology/natural building projects and hubs. While traveling, he explored how permaculture and off the grid design can help people rich and poor lead better lives, while also protecting our world. Our first storyteller, Matteo, shared lessons from his travels throughout the Americas. Matteo’s journey was not only one of self-sustenance and adventure, but one of cultivating awareness of the suffering of others. He traveled about 8,500 kilometres in North and Central America for four years with only four saddlebags, and very little money (about $1,000 per year). The gift, he says, of his travels in the Americas was the awakening of his passion for permaculture and sustainable living. The pressure of modern life has caused many cultures to lose vital traditions of self-discovery, such as being forced to travel solo – a “good education” enabling one to consciously look, and “feel and see today’s suffering of oneself and others”, engaging with things that are hard, embracing suffering with “reverence and gratitude”, as Matteo puts it, all for the betterment of the human species. Mark has worked in business development and administration for over 30 years and has been an organizational developmental officer in the citizen sector in the US, Canada, India and China. He worked with Natooke, a custom bicycle shop, to plan and host regular rides to Anlong, a sustainable farming community about 40 kilometres away, using existing separated bicycle paths, backcountry roads and farmers’ fields to guide the way. Interest was instant, with groups of over 50 people, comprised of locals, expats and students participating. Laurie-Ann is a climbing instructor and coach, working as a supply teacher at Havergal College and at Basecamp Climbing, along with spending her spare time working at Mountain Equipment Co-op. Laurie-Ann is a professional adventure seeker and spontaneous traveler and can always be found planning her next trip. Laurie-Ann, the third storyteller of the night, and self-proclaimed “attempted cyclist”, began cycling in the city last summer with the encouragement of her roommate, BIKE MINDS’ own Matt Pinder. She previously thought it unfathomable, but being a thrill-seeker, decided that “cycling fits right into that!”. She now rides in the city, even at night – at times with a pizza in hand. With admittedly little cycling experience, Laurie-Ann decided to complete a bike tour last November, giving herself two weeks prior to departure – one week to decide if she was serious about it and one week to prepare. She had no idea where she would go. After two weeks of questions, and much doubt, she decided “F that”, getting a friend to help her put together a touring bike ready for the road. She ended up traveling 230 kilometres in 25 hours, heading eastward from Toronto to Prince Edward County. Although it was challenging as it rained 80% of the time, and she experienced what it was like to ride in hail and high winds, she found solo cycling gave her so much time to think, to feel. Her advice to others, including novices, is to “just go.” Her next plan is to not endure much legwork on two wheels – that is, she is planning a motorcycle trip to Colombia in two years! Omar is an avid cyclist, spending a lot of time on his bike, whether it is commuting to work, moonlighting as a delivery guy or going out for leisurely rides in the city. His bicycles are central to his life in Toronto. Udai is a 20-something professional that has lived and worked downtown for 10 years. He is passionate about finding happiness in his daily life and has separation anxiety issues with his bike. In the summer of 2016, the two became Canadian citizens and decided to drop everything to see the country by bike. So they took the train from Toronto to Vancouver and spent the next 70 days biking their way to St. John’s, Newfoundland. Over the course of the journey, they were immersed in the sheer immensity of Canada, the kindness of its people and the joy of being on a bike for the majority of their waking hours. Omar and Udai, although four years apart in age, knew each other and grew up in Dubai together. They also each moved to Canada (again four years apart), both becoming citizens in 2016. After some time taking transit from downtown Toronto to and from work in Mississauga together, they decided to become commuter cyclists, gradually progressing to biking to Niagara Falls. But they wanted to do something bigger, so they planned a bike trip across Canada, from British Columbia to Newfoundland, buying their ticket to Vancouver a year in advance to give them time to prepare. “Cycling is suffering”, which is what is actually great about it, notes Omar. Despite a rough start (a crash on the highway within the first half hour), the Rockies became their “training” ground, where they had to complete three difficult passes – Mount Coquihalla, Rogers and Kicking Horse. They discovered the Prairies were not completely flat but presented the challenges of maximum exposure and wind resistance. From there, they travelled the edges of the Great Lakes, into the states of Minnesota, Wisconsin, and Michigan, and back into Canada via Sault Ste. Marie. They continued into Ontario, and onto the Great Trail, eventually reaching the Atlantic Ocean. All along their journey, they encountered generous hosts via Warm Showers, meeting lots of cyclists along the way, all the while noticing and absorbing how culture and language changes across the Canadian landscape in real time. Their main take-away from their cross-country journey was the unforgettable people they encountered and interacted with. Jacqueline is a seasonal forestry worker in Northern British Columbia during the summers. It was through tree planting that she was introduced to the world of bike touring. In 2016 she hitchhiked to Victoria, built a bike at a co-op, attached buckets to it, and pedaled to Mexico City. It was a life-altering trip and she refuses to shut up about it. Most recently, Jackie has joined Charlie’s Freewheels through their build-a-bike program, and advanced mechanics workshops with the goal of using cycling as an educational tool to make a difference in her community. The night’s headliner, Jackie, began her talk reliving the moment of her arrival to her grandmother’s house in Mexico City after months on the road: the streets became familiar, she turned off her GPS, the realization of the miles behind her, and the aloof reaction of her relatives when she arrived! She had cycled thousands of kilometres from Victoria, BC, to Mexico City in the span of four months. Although she was not an avid cyclist, she had been intrigued by bike tour stories she heard from colleagues while tree planting in BC. At first, she experienced many doubts and probing questions; with the help and encouragement of the Victoria bike co-op, Recyclistas, she built a road-ready bike – complete with bucket panniers – within a week and a half. Her bike, “Baby Frankie”, was born. Despite being secretly nervous (to the point of wishing someone would steal her bike), she forced herself to post an #accountabilitypost on Instagram and began her journey. “Why?” was the question she encountered most, and to this her response was it would be a trip of ultimate self-sufficiency, one of complete independence, solitude and moments with wilderness. Well, these were her expectations. It took no time at all for these expectations to be shattered, and the reality was that she was hardly ever alone on the journey, meeting people from all over the world, and experiencing unforgettable moments, such as crossing the Golden Gate Bridge, with a group of other cyclists. These encounters have become lifelong friendships; she maintains contact with many that she met on her trip – the amazing adventure was in the people she met. Even though she doubted herself every single day she was on the road, she did it – something that she remembers even now when dealing with daily difficulties. As Jacqueline says, there is “no wrong way, no right way” when travelling by bike. The key is to let life happen, and leave the door of spontaneity open. Her plan is to travel to Argentina by bike next! The Winter 2019 BIKE MINDS series continues later this month with Bikes+Career at Fix Coffee + Bikes on February 27. Join our mailing list for updates!